Lately I’ve been thinking a lot about Conor’s future. I can’t help it, I’m a “planner” at heart. I can be spontaneous, as long as I schedule time for that on the calendar. Plus, planning makes me feel like I have more control over this autism thing. Now that Conor’s a teenager, I have to start thinking about what we’re all going to do when he becomes an adult. We’re getting older, I’m getting lamer (physically, watch it), and Conor’s getting bigger. And so, I plan. Many parents of children with developmental disabilities can’t imagine their child living outside their home. Me? I kind of thought that getting your children safely grown and the hell out of your house was a sign of successful parenting. You teach them how to hunt, clean and gut a fish, pick up their damn clothes off the floor already, read a book, scrub a toilet, and get a job, right? So I’ve had to really change my definition of successful parenting when my son regressed and then again when he developed a real behavior problem. Recently, I got a look at a residential house for two young women with autism. I really liked the model of sharing a house and sharing staff as these two women began to live (sort of, kind of, but not really) independently. Never mind that the two ladies weren’t really getting along all that well. My husband bugs me often enough and we’re still living together. There’s a house manager in the house 24 hours a day to support the women, and there are support staff that cycle through in shifts. Each woman has her own 1:1 throughout the day and is transported to vocational programs during the day as well. I’m not sure exactly how many support people are employed specifically for these two women, but, by my count, there’s got to be at least 6 plus a supervisor for them all. My lord, they must have more people to service them than Hugh Hefner does. But that’s the reality. That’s what it takes to support many individuals with autism successfully. So… back to the squirrels in my addled brain. The way I figure it, my husband and I will build a compound, much like the Kennedys. 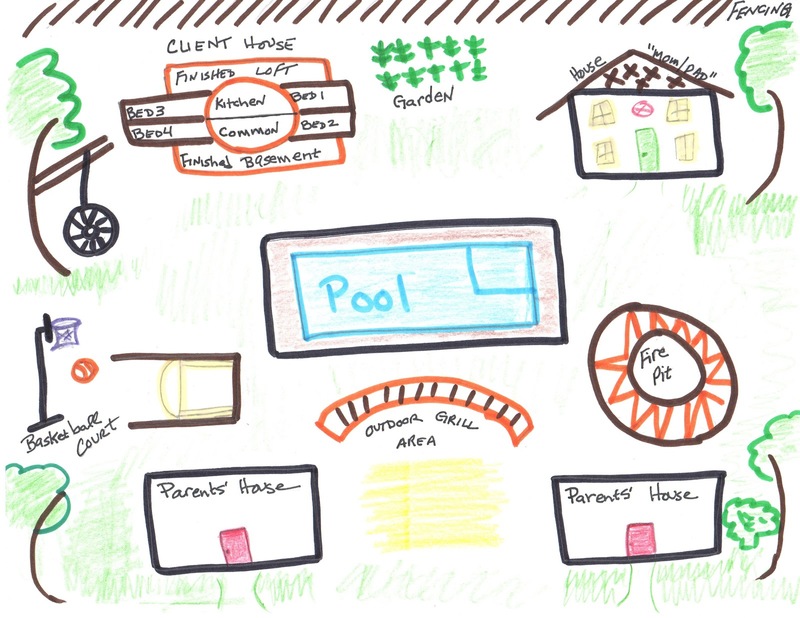 It would be fabulous, and have all the amenities like a shared pool with hot tub, fire pit, basketball court, tire swing, common outdoor patio area with a gas grill, and, of course, an organic vegetable garden. Client house: a house for my son and a buddy with autism, and their live-in and daily support staff. Caretaker house: a dwelling for a “House Mom” or “House Dad” and their family. I’m thinking maybe they’ll have their own family there so we’ll have to find land in a good public school district. Rent will be free. They’ll be responsible for making sure the house coverage runs smoothly, so Jim and I can go on cruises and stuff. I figure a solid salary and free rent with good public schools makes for a pretty good compensation package. Retention of good employees is so important. Other parent house: we can sell a parcel of the land to the other parent and they can build whatever they want. Here, I drew a picture of it for you. And, for the client house and the caretaker house, the two families will establish separate trusts that will fund both the ongoing maintenance, property taxes, support staff, sundries, groceries, etc. We’ll establish the trusts right after we both win (and split) the $102 million Mega Millions lottery. Hey, it could happen, right? Hmmmm, I didn't think about that. You're right, I should make sure that I take the house on the lower right hand corner, the furtherest away from the court, LOL! I have the same thoughts just about every day- where Sam is going to live when I'm old and decrepit. It keeps me up at night. I wish it were easier. We have enough to worry about. I worry about what cousin of Conor's is going to have to help Aidan care for him as they both get older. Gah.